William and Mary travelled to Southport, North Carolina to open play in the Colonial Athletic Association Championship. 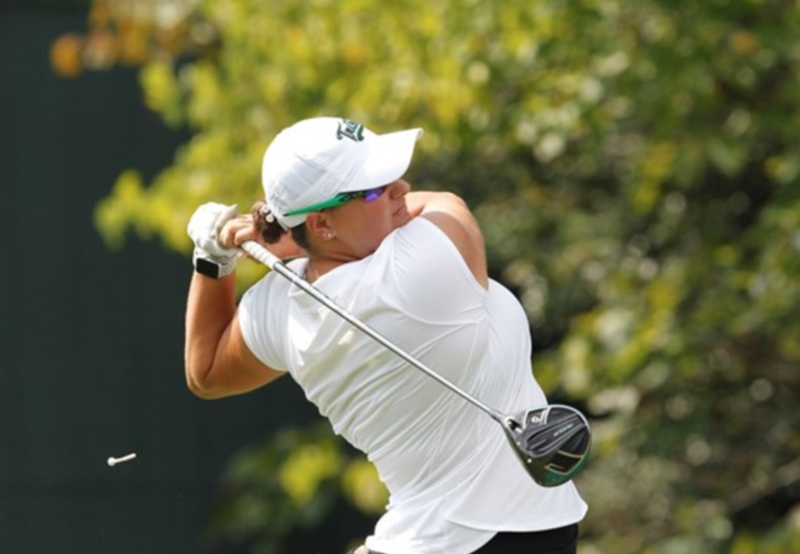 The College finished in seventh place with a total of 969 (+105), but an outstanding fifth–place performance by junior Allison Olberding granted the College its ninth top-five finish in its history. North Carolina–Wilmington finished first with a score of 918 (+54). Opening its first round, the Tribe ended in seventh with a 329 (+41), led by Olberding who carded a 79 (+7). Sophomore Madison Braman and freshman Sarah Houle were just behind Olberding, recording 82 (+10) each. Houle was tied for second in the tournament in par-5 scoring, ending one under par, while Olberding was tied for third in par-5 scoring at even par. Ending the second, the College fired a 317 (+29), taking two stroked off its first-round score, and ending the second round in seventh place with 646 (+70). Olberding had become a force to be reckoned with, as she recorded the low-round of the tournament with a 72 (E). Tied for fourth with a 151 (+7), she trailed Seahawk Thao My Nguyen by just three strokes. Of the remaining Tribe players, scores trended lower in the second round. Braman took three strokes from her first–round score, shooting a 79 (+9), while Houle shot an 81 (+9) and sophomore Madison Elliott shot 85 (+13). In the final round, the College shot a 323 (+35) to finish seventh in the 2019 CAA Championship. Olberding ultimately placed fifth with a 228 (+12), rounding out the final round with a 77 (+5), the Tribe’s low score for the day. She was surpassed by Seahawks Phu Khine’s 223 (+7), who took first place in individual scoring. The Tribe will return to action in the fall.